Enjoy the best of great-tasting food and health! 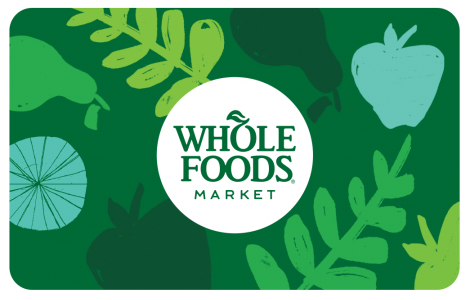 Whole Foods Market® is America's Healthiest Grocery Store™ and the world's leader in natural and organic foods, all subject to our strict quality standards that prohibit hydrogenated fats, and artificial colors, flavors, preservatives and sweeteners. Animal welfare, seafood sustainability and safer personal- and home-care products are top priority. Let our friendly, knowledgeable team members help you find what you need, from healthy basics to pantry staples to local and global specialties. Gift cards never expire and can buy anything at any of our more than 400 stores in the U.S. and Canada. This magical card can be used at any Whole Foods Market® store in the US or Canada. Present this card to the cashier at the time of redemption. The available balance will be applied toward your purchase from soup to nuts, but may not be used to purchase other gift cards. Enjoy it all now or save leftovers for later! You can use this card to buy our greens, but it is not redeemable for cash except as required by law. This card will not be replaced or refunded if lost or stolen, so handle it like a carton of eggs. This card is issued by WFM Gift Card, LLC (the “Issuer”), who is the sole obligor to card owner. This card may not be resold unless approved by the Issuer. Unlike milk, this card doesn’t have an expiration date, nor does it incur any fees for any reason. Purchase, acceptance or use of this card constitutes acceptance of the complete terms and conditions, available at wholefoodsmarket.com/terms. For balance or other questions, visit wholefoodsmarket.com/giftcards or call 866–936–2255.